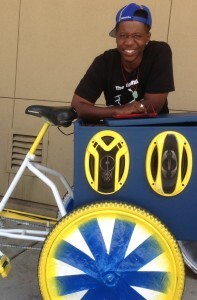 The Original Scraper Bike Team mustered at noon on Saturday, June 11 at the 81st Ave Library. Scrapers torqued chains and pumped air in their tires as they prepared to ride to the grand opening of their new home. Minutes later, the Scrapper Bike Team was on the move, snaking in formation along International Blvd and gliding up 82nd Ave to Bancroft. 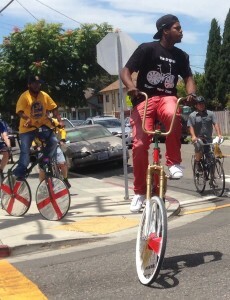 Founder/ CEO Tyrone “Baybe Champ” Stevenson Jr. set the pace in his bright blue and gold, Golden State Warriors-themed three wheeler. 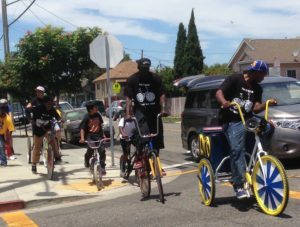 Also known as the Scraper Bike King, he ratcheted up the volume on his sound system, blasting his own hip-hop anthem to the scraper bike movement, On the Scene. “Music at loud and ignorant levels,” he told me later, “is what really gets this community’s attention”. Drivers honked support. Pedestrians waved and shouted out approval as some 20 riders weaved down Havenscourt. 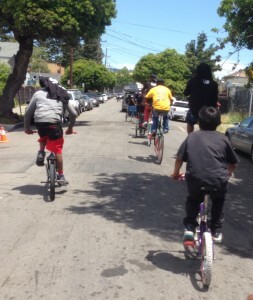 They ranged from 11- year- olds on bright-rimmed BMX bikes to several bikers in their mid-20’s mounted tall on double-framed “skyscrapers,” including Burnette in the middle of the pack. Two otherwise out of place senior cyclists in spandex — board members of Bike East Bay — brought up the rear as the riders coasted into their new home at the King Branch of the public library at International and 69th Ave. Fellow team members, bike advocates, library and BART officials celebrated their arrival. The barbecue sizzled with traditional and vegetarian fare to go along with sliced watermelon. A stationary bike powered a blender to make smoothies next to their new home, a former shipping container turned bike shop. 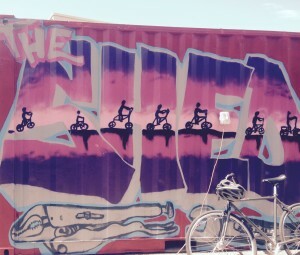 The Shed — the culmination of the long collaborative efforts of the Scraper Bike Team, Oakland Public Library, and the bicycle advocacy group, Bike East Bay and other supporters — was officially open for business. 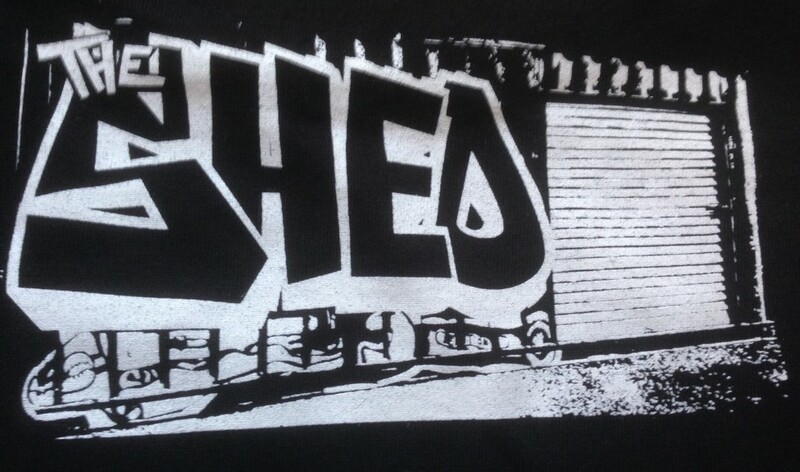 Open Saturdays from 1 p.m. to 3 p.m., The Shed is a youth-led, no-fee bike shop open to all bikers and staffed by members of the Scraper team and local volunteer bike mechanics. 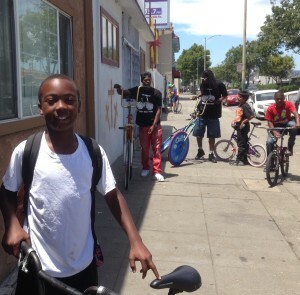 Aside from the 81st Ave Library’s Friday afternoon fix-it clinic — which has served thousands of cyclists of all ages since it opened a year and a half ago — it is the only place between Fruitvale and San Leandro where cyclists can do minor repairs. 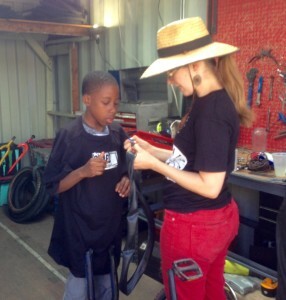 And, unique perhaps to any bike program, it is where young Scraper Bike Team members have the opportunity to make their own bikes. When a fire gutted Stevenson’s house, El Colectivelo, a no- fee bike collective geared toward Latin American refugees near 50th and International, stepped up to share its rent-free space with the Scraper team. 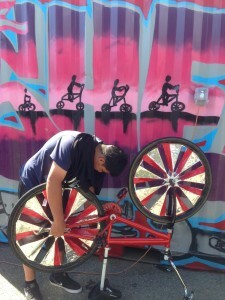 For more than three years, scrapers shared tools and expertise with Spanish-speaking day laborers building their bikes to be their main mode of transportation. When Colectivelo lost its rent-free space last fall, supporters came together to find the Scraper Team a new home. Bike East Bay, which has served as Scraper Bike’s fiscal sponsor, found an anonymous patron to donate a shipping container. The Oakland Public Library, where Burnette works part time, offered space at the King branch. Colectivelo passed on its large supply of specialized tools, work stands, frames, forks and spare parts. 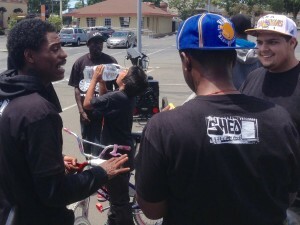 Meantime, as Bike East Bay Advocacy Director Dave Campbell served up barbecue, team members were on the job. BART Director Robert Raburn and local resident Ernesto Vicera dropped off large boxes of bike supplies. 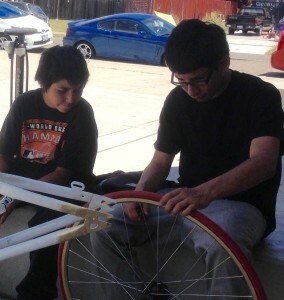 Kanninen showed Jakoby how to patch a flat. 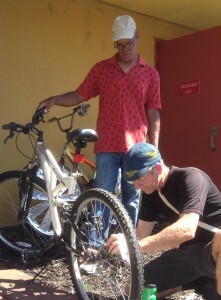 “Bike Dave” Favello fixed a library patron’s broken chain. 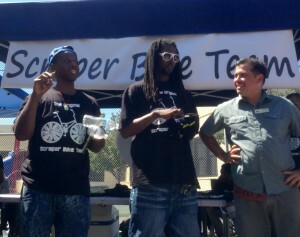 The Original Scraper Bike Team is an all volunteer organization which runs strictly on donations and volunteers. 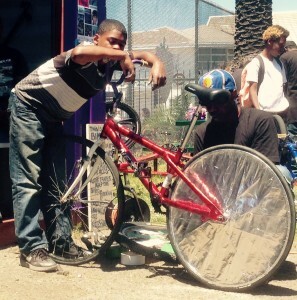 Please donate and volunteer here: https://bikeeastbay.org/news/strengthening-scraper-bike-team. The Shed is open every Saturday, 1 p.m. to 3 p.m., at the Martin Luther King Jr. Branch of the Oakland Public Library, 6833 International Blvd. Building on the momentum of The Shed’s grand opening, the Original Scraper Bike Team will hold its first volunteer meeting on Tuesday, July 19, 81st Ave. Library at 5:30 — 7 pm. Work space, promotion, and event planning are on the agenda. 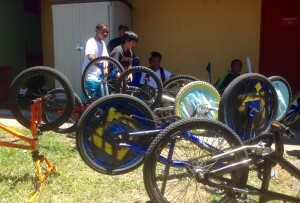 To find out more, contact OSBT President RB Burnette: 510-565-9656 (message), scraperbikepres@gmail.com or Founder/ CEO Tyrone Stevenson: scraperbikes@gmaihttp://scraperbikes@gmail.coml.com. I knew nothing about this wonderful program. It’s great to read about such inspiring people, who are doing so much to support the community. When one is inundated with bad news coming out of Oakland, B Joyce’s well written heart-warming story is good news indeed.Joyce’s’ style draws one into the scene and leads you through until I was left with a smile on my face.